TED 2019, a week of speaker sessions, workshops, and conversations about the directions technological and political progress are leading society, has touched down in Vancouver. Appropriately enough, the Cambridge, Massachusetts–based firm Matter Design and CEMEX Global R&D have used the event to unveil the fruits of their concrete research. Matter Design is no stranger to experimental stonework (nor is CEMEX, for that matter). 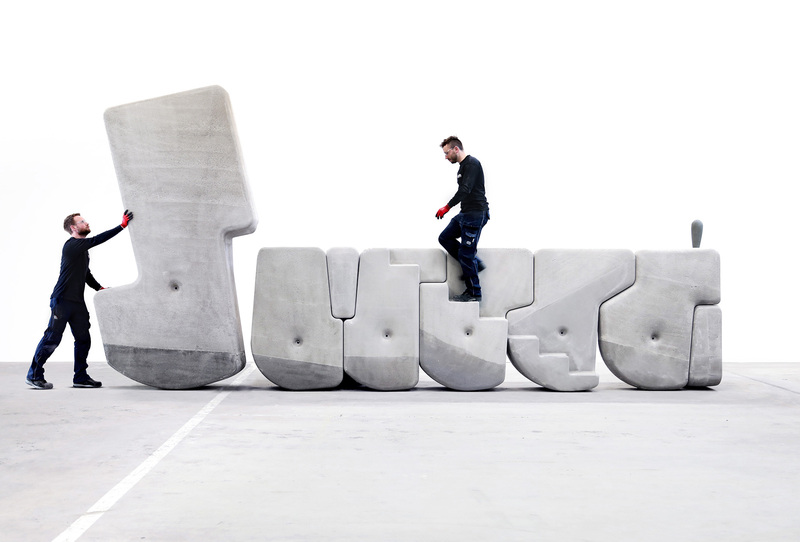 Engineering tightly-interlocking slabs and complex concrete forms have been a constant in their research, and both Janus and Walking Assembly take their explorations to the next level. Janus was originally revealed simultaneously last year at the American Academy in Rome and on the campus of MIT. Matter Design and CEMEX teamed with composers Federico Gardella and Simone Confort to create a multi-sensory experience that demonstrates how heavy masses can still move with a rollicking sense of joy. ﻿ In a video of the display of Janus, a crescendo of whispers draws the crowd’s attention to the stage, where they’re presented, in both senses of the word, with an enormous box mocked up to resemble Rome’s four-gated Arch of Janus. The blue, orange, and pink box slowly flops over to reveal that it’s simply a wrapper, and from it emerges a massive concrete wrecking ball, or kettle ball–shaped object. Emphasizing the split nature of the Roman god that Janus takes its name from, the concrete object, a solid ball with a hollow handle on top, wobbles and spins but always returns to an upright position. Walking Assembly continues on the theme of playfully rocking solid concrete masses with another historical twist. How did ancient peoples move the Moai of Easter Island? One theory is that these massive statues were designed to be “walked,” or gradually rocked, into place. Walking Assembly, seeking to divorce the concept of masonry’s scale from that of the humans placing it, returns to these preindustrial construction techniques. These massive masonry units (MMUs) are designed to be moved and fit into place without the help of cranes or other construction equipment. Using rounded edges, handle points, and by pouring variable-density concrete to control each MMU’s center of gravity, the components can be easily rocked, tilted, and rolled into place. Both projects, through using computer modeling and advanced fabrication technology, force the objects themselves to do the heavy lifting and free the user, or construction worker, to play around with the components. It's a fitting tie-in for a conference probing where technology can take us. By translating an ancient method of masonry into a digital procedure, Matter Design developed Cyclopean Cannibalism as a sustainable alternative to the standard practice of landfilling demolition debris. This project illustrates how the carcasses of previous buildings could be reused as a new material. To do this, rubble is scanned and input into a digital algorithm that sorts random shapes. Each stonelike component is carved by a robotic arm and recomposed into a new construction. In today’s urban context, we generate unprecedented quantities of waste. In order to more intelligently reconsider existing building stock, the profession could learn from cyclopean construction. Can our future cities digest themselves? Academia has always been a hotbed for innovation, and as part of a new series on under-the-radar projects on university campuses, AN will be taking a look at the smaller projects shaking things up at MIT. Modernized applications of ancient techniques, robotically milled artifacts, and boundary-pushing fabrication methods are producing new materials and structures worth publicizing. Cyclopean Cannibalism For the research and design studio Matter Design, contemporary reinterpretations of ancient construction and crafting techniques are valuable sources of new architectural insight. 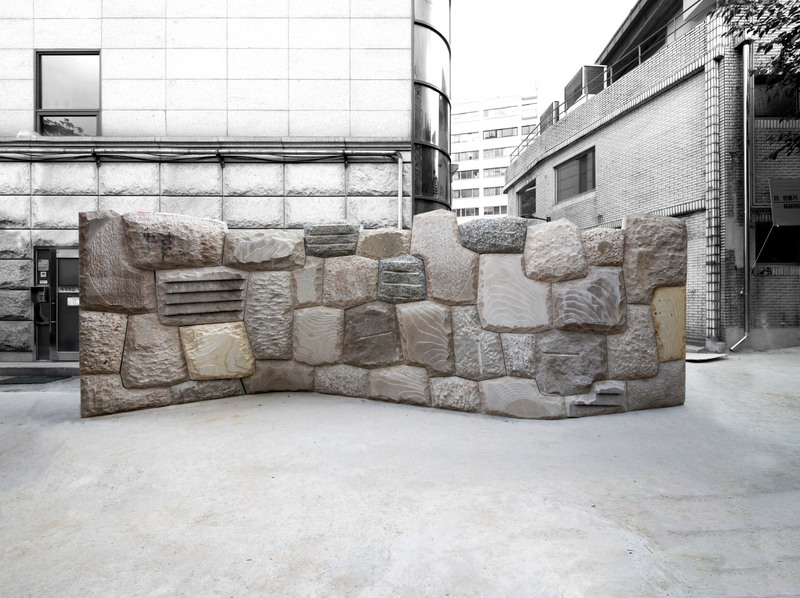 The studio, a 2013 winner of the Architectural League Prize for Young Architects + Designers, found that a Bronze Age stone-stacking technique was a fertile testing ground for exploring new uses of construction waste. Forming walls and structures by fitting boulders and large stones together without working or cutting them first, also known as Cyclopean masonry, is a technique that developed independently all over the world. The limestone boulder walls of the ancient Mycenaean Greeks were supposedly constructed by cyclopes, the only creatures strong enough to move such large rocks. The Inca used this methodology in the 15th century, but unlike the Greeks, they regularly disassembled previously-built walls for new materials, creating cities that were constantly in flux. This recycling of construction materials piqued the interest of Matter Design principals Brandon Clifford and Wes McGee, who wanted to apply the same principles of adaptive, sustainable design to the mountains of architectural debris clogging landfills around the world. The resulting “cookbook” is a prescription for turning cast-off precast concrete into new structures. In The Cannibal’s Cookbook, Matter Design has created a tongue-in-cheek collection of recipes for turning rubble into reusable materials. The limited-run book is one part primer on how to select stones based on their shape, one part practical instruction guide, and one part guide to one-eyed mythological creatures from around the world. Not satisfied with a theoretical tome, Matter Design teamed up with fabrication studio Quarra Stone Company to build Cyclopean Cannibalism, a full-scale mock-up of one of their recipes. 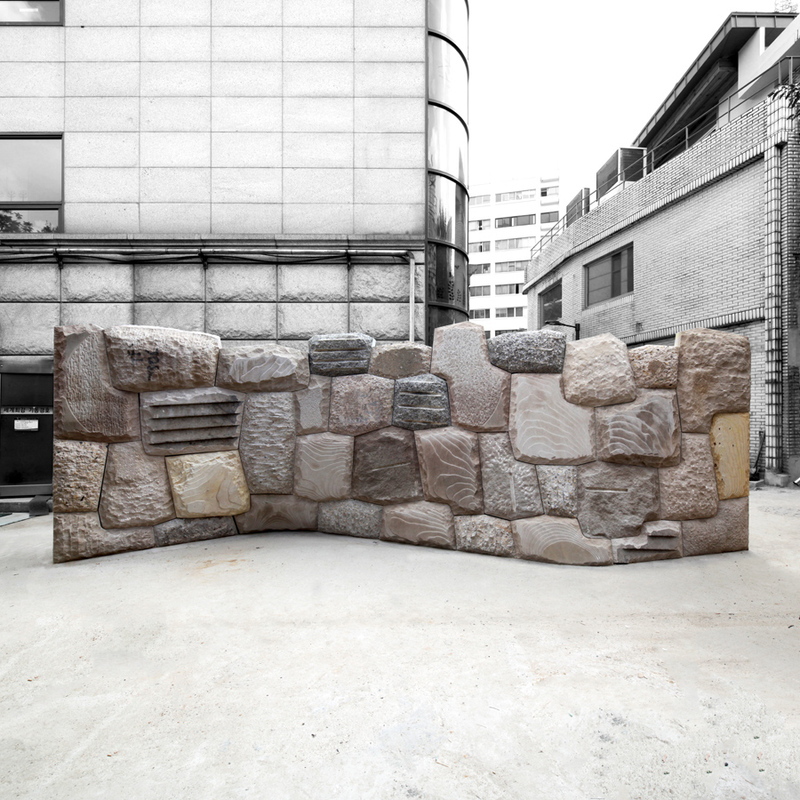 The resulting wall, a curvilinear assembly of concrete rubble and stone, was installed at the 2017 Seoul Biennale of Architecture and Urbanism in Seoul, South Korea. Other Masks Cambridge-based WOJR, named after founder and principal William O’Brien Jr., creates work that bridges the gap between architecture, culture, urbanism, and art. In the exhibition Other Masks, the studio explored the intersection between architectural representation and artifacts, where drawings and models cross over into the realm of physical objects capable of being interpreted in different ways. During the Other Masks show, which ran at Balts Projects in Zurich, Switzerland, the WOJR team filtered architectural detailing through the lens of masks. Masks are artifacts with significant cultural value in every society, and transforming the facets, grids, angles, and materials typically found in a facade into “personal” objects was meant to imbue them with the same cultural cachet—and provoke viewers into wondering who crafted them. WOJR designed seven unique masks and a stone bas-relief for the show, enlisting the help of Quarra Stone to fabricate the pieces. Unlike its work for Cyclopean Cannibalism, Quarra Stone used robotic milling combined with traditional techniques to give the sculptural objects a high level of finish. Other Masks sprung from WOJR's unbuilt Mask House, a cabin designed for a client seeking a solitary place to grieve in the woods. Through this lens, WOJR created what they call “a range of artifacts that explore the periphery of architectural representation.” Active Textile The work of MIT’s Self-Assembly Lab is regularly publicized, whether it is the lab’s self-assembling chair or a rapid 3-D printing method developed with furniture manufacturer Steelcase that allows for super large prints in record time. The lab’s latest foray into active materials, Active Textile, is the culmination of a three-year partnership between lab founder Skylar Tibbits and Steelcase in programmable materials. Imagine a world where, after buying a pair of pants, a store associate would then heat your clothes until they shrank to the desired fit. Or a high-rise office building where perforations in the shades automatically opened, closed, twisted, or bent to keep the amount of incoming sunlight consistent. 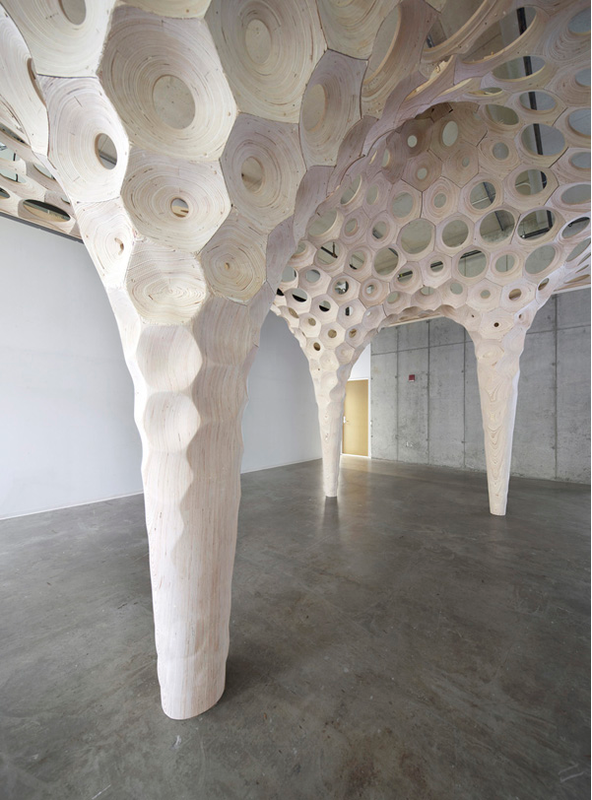 In the same way that pine cones open their platelets as humidity swells the wood, the fabric of Active Textile mechanically reacts to light and heat. The team thinly shaved materials with different thermal coefficients—the temperatures at which they expand and contract—using a laser to minimize waste, and laminated the layers to form a responsive fabric. The fabric was stretched between a metal scaffolding. Applied-material designers Designtex digitally printed patterns on both sides; the front was printed to allow the fabric to curl in response to heat, while the back allowed light to shine through. 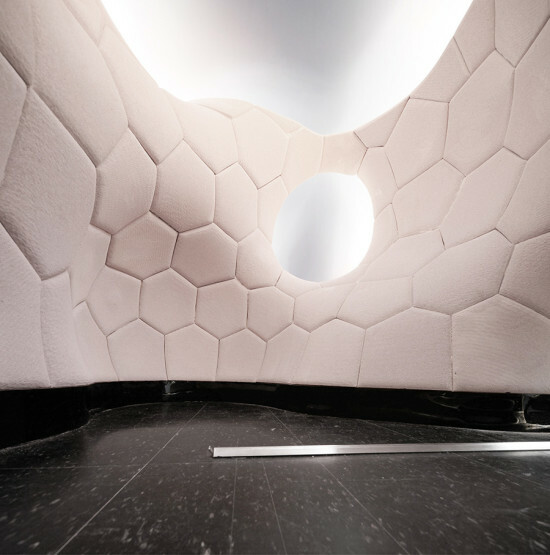 Active Textile is currently on view at the Cooper Hewitt, Smithsonian Design Museum’s The Senses: Design Beyond Vision exhibition through October 28. The Self-Assembly team is researching more commercial uses for the material, such as in self-adjusting furniture or programmable wall coverings. 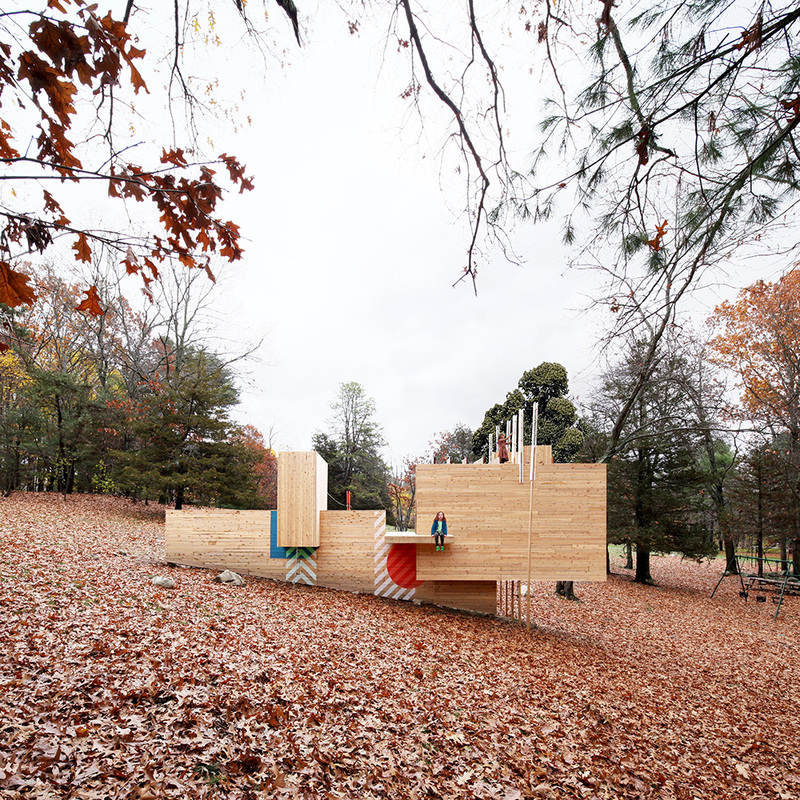 2017 Best of Design Award for Small Spaces: Five Fields Play Structure Architect: Matter Design + FRISCH Projects Location: Lexington, Massachusetts Five Fields Play Structure is designed for playful ambiguity and experimentation. Twenty-foot-tall vertical elements are functional pieces of the structure as well as whimsical shapes. The colorful graphics suggest entries and key moments, without overtly labeling them. Preconceived architectural elements like doors and stairs do exist, but lead nowhere. Thresholds are tucked under levitating volumes balanced on a single wall. This design strategy provides multiple means of access to any location, allowing children to make decisions based on their comfort and imagination. 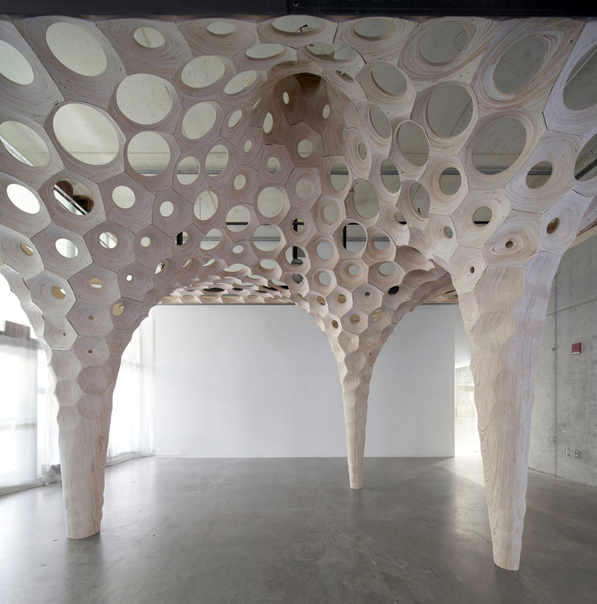 “This is delightful design that refuses both the formal and functional tropes of play structures. Though the construction appears straightforward and some of the forms and elements familiar, the space seems to be full of surprises.” —Irene Sunwoo, Director of Exhibitions, GSAPP (juror) Graphic Design: Johanna Lobdell Honorable Mention Project: Attic Transformer Architect: Michael K Chen Architecture Location: New York Working within a 225-square-foot home in Manhattan’s West Village and an adjoining five-foot-tall attic storage space, this project adapts the attic to numerous apartment functions. The entire space was aggressively subdivided and loaded with custom-fabricated transforming elements, including hanging clothing storage, pantry storage, and a pull-out dining table, paired with a pull-out workstation. 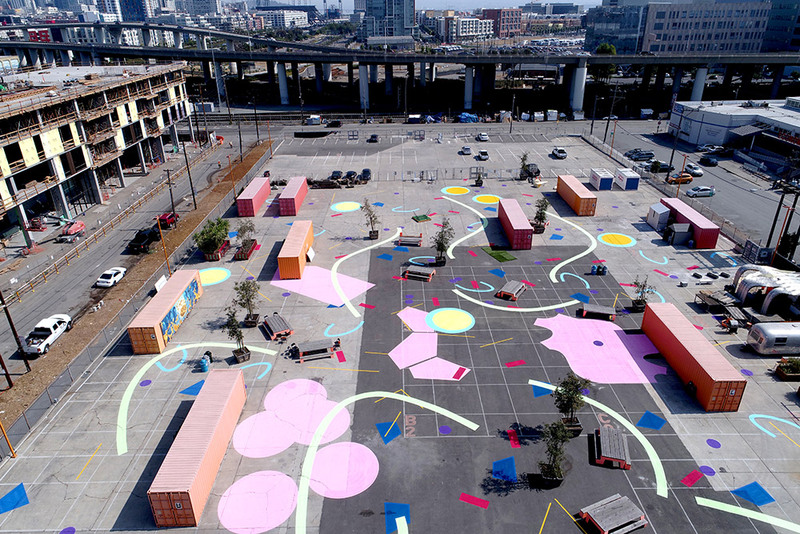 2017 Best of Design Awards for Landscape – Public: Confetti Urbanism Architect: Endemic (Clark Thenhaus) Location: San Francisco, California Confetti Urbanism reimagines the California College of the Arts Back Lot as a display venue, work yard, and social space. The 73,470-square-foot Back Lot presents prototypes of the Designing Material Innovation exhibition while supporting student design activities and equipment—from a welding station to hammocks. Confetti Urbanism celebrates the diversity of the Back Lot’s many components by organizing them as though they were tossed confetti, creating a loose yet carefully studied frame for the prototypes on display and animating the site through function and festivity. “The spontaneity and framework of this project is incredibly engaging and refreshing. A parking lot is transformed through simple strategic interventions and a democratic vision into a dynamic open-air laboratory for material innovation and creation. They’ve shown a parking lot can become a platform for interaction and creation.” —Emily Bauer, landscape architect, Bjarke Ingels Group (juror) Curator: Jonathan Massey Pavilions By: APTUM Architecture T+E+A+M CCA Digital Craft Lab Matter Design Buoyant Ecologies Float Lab Honorable Mention Project: Farnham-Connolly State Park Pavilion Architect: Touloukian Touloukian (Pavilion Architect) with Crosby Schlessinger Smallridge (Landscape Architect) Location: Canton, Massachusetts Farnham-Connolly State Park Pavilion began as an environmental cleanup of an abandoned municipal airport. Surrounding wetlands were remediated, and PCB-impacted soils were collected under a permeable geo-textile cap for the location of a new park and comfort-station pavilions. Both pavilions meet the social and physical needs of visitors, while paying homage to the area’s history of flight. Honorable Mention Project: The Meriden Green Architect: Milone & MacBroom Place: Meriden, Connecticut Meriden Green began as a flood-control project 20 years ago and became the catalyst for economic revitalization by transforming a brownfield into a greenfield. The firm executed a Connecticut city’s vision of large expanses of lawn for events and play; pedestrian routes; a bridge linking neighborhoods; and new development opportunities. In a revolt against the realm of the 3D renderings they feel contemporary architects are confined to working within, Matter Design's principals Brandon Clifford and Wes McGee founded a studio grounded in digital design that addresses the realities of materials, loads and physicality. Clifford in particular mourns the loss of our "ability to work with volume," so much so that he spent his year as the 2011-12 LeFevre Emerging Practitioner Fellow at Ohio State University Knowlton School of Architecture researching volume in building with a special focus on stereotomy, the art of precisely carving solids. It was this research that led him to design La Voûte de LeFevre, a vaulted wooden structure that soars thanks to weight and mass, not in spite of it. La Voûte (French for vault) is a compression-only structure, meaning there is zero tension. Think of it like the inverted spires found in Gothic cathedrals. "Those spires are not decorative," said Clifford and McGee in an email. "They are, in fact, redirecting this thrust network down into the column. If you took the spire off the cathedral the structure would collapse" (Watch two short videos Matter Design made to illustrate this point). To design a reverse spire with a perfectly balanced weight ratio, Clifford found that the computer modeling software he needed didn't exist, so he wrote his own. Called Thick Funicular, the program runs a particle-spring library across a desired geometry. "Each particle in the system calculates the distance from the desired geometry and then reassigns that value to its weight,” said Clifford. “It can open and close apertures to make a unit weight more or less relative to its neighbors. Once the calculation has guaranteed that a solution holds a thrust network inside its thickness, the process is complete and the units are carved with their uniquely dimensioned holes. I think the key here is to think of these holes as controlling the volume (or weight) of each unit relative to its thickness and location in the figuration of the vault." Even though stone is traditionally used in stereotomic projects, Clifford and McGee had, among other constraints, a budget to consider, and so chose to work with Baltic birch plywood, which "is homogeneously dense and has significant self-mass." Unfortunately, it only comes in ¾ inch sheets, hardly thick enough for La Voûte's 2 to 12 inch-thick structure. Clifford and McGee knew they would need to glue the wood together in layers, but to reduce waste they "segmented the units, cut them from the ¾ inch sheet material and stacked them together into the rough geometry of the final unit (plus ⅛ inch for safe measure). Those sheets were then placed on the five-axis mill and carved to the precise geometries." If you can't wrap your head around that, watch the video of the milling process. You'll see the five-axis Onsrud router, an incredible machine fitted with a large bit that cuts with the tip as well as with the sides, removing the most material with the minimum effort. 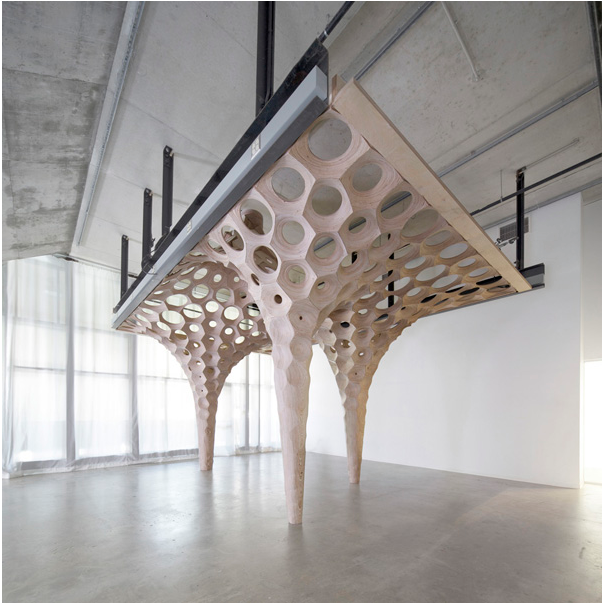 After it was fabricated in University of Michigan’s FABLab, where McGee is the director, it was transported to the Banvard Gallery at Ohio State University Knowlton School of Architecture. Clifford and McGee installed La Voûte from the top down using a compression ring around the perimeter of the room as a tool against which they could measure each row as they worked their way down. 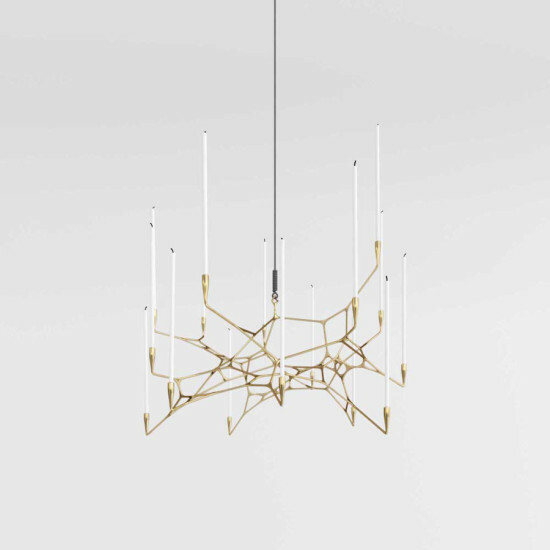 Like the spires of Gothic cathedrals, La Voûte was built with a vertical thrust designed to last a lifetime, but because the installation is temporary the individual units are held together with screws and wooden dowels to allow for their removal. Still, La Voûte – or rather the ability to design and fabricate a structure like it – lives on in Clifford's remarkable new Thick Funicular program.